Based on artwork by Tess Fowler. 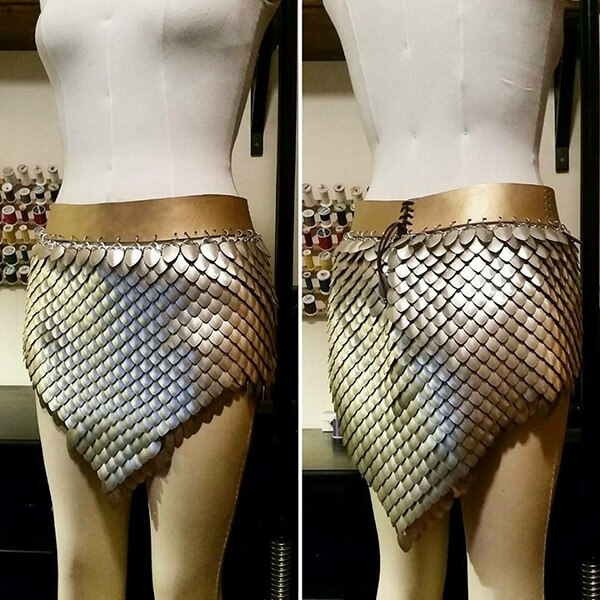 I began the process with the scalemaille skirt. This was the second scalemaille project I had worked on, so was already familiar with the weave. The challenge here was fit and shaping for the skirt. 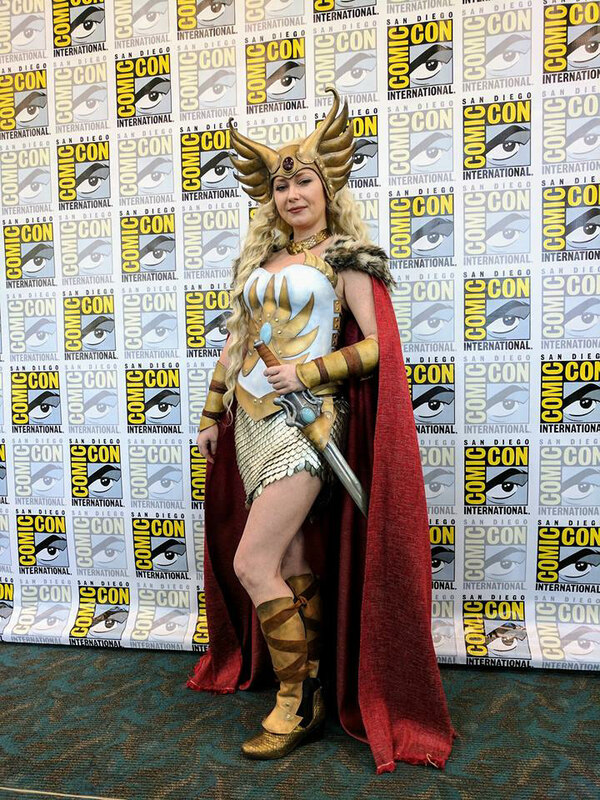 I built the skirt in three panels: front, back left, and back right, connecting them once each panel was complete. After fitting and adjusting, the skirt was connected to a leather waistband that laced at the back. 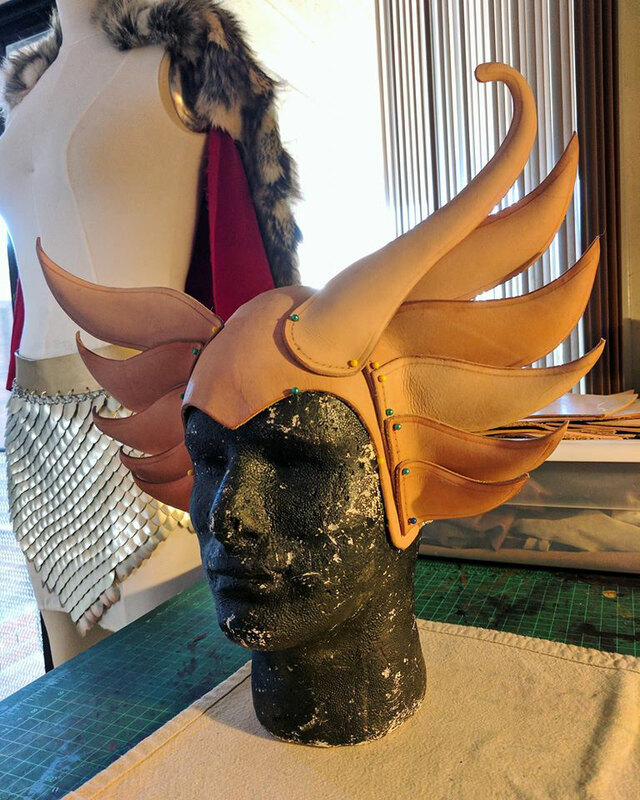 Next, I tackled the headdress and bracers. This would be my first foray into wet-molded leather and a good learning piece before attempting the breastplate. 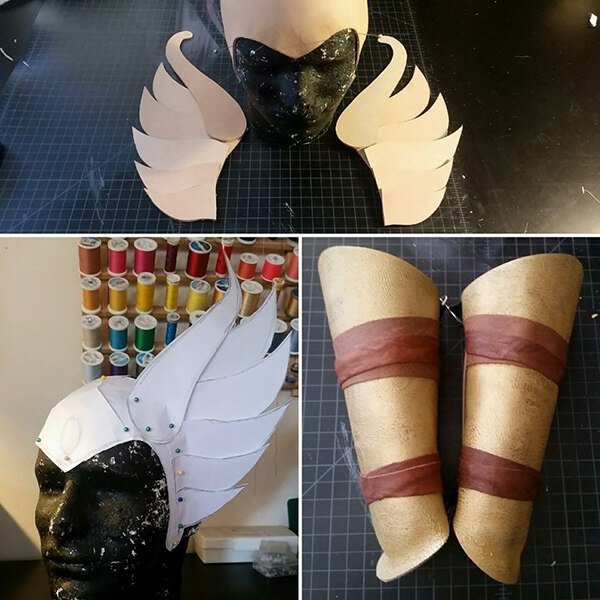 I patterned the headdress and bracers in paper first, then cut all pieces out of leather. 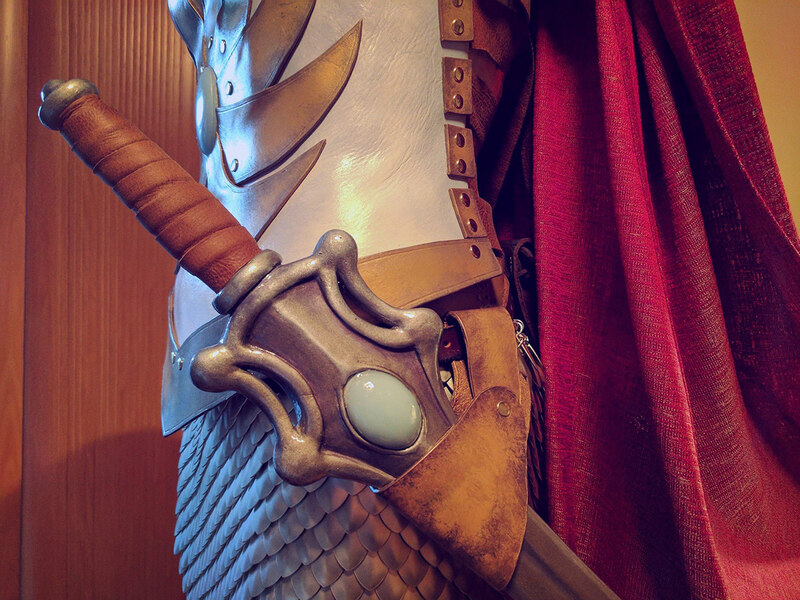 I used veg-tan for the helmet and a textured crackle leather for the bracers to give them a battle-worn look. I shaped the base of the headdress first, punched stitch and rivet holes for the wings, then shaped the wings one at time. 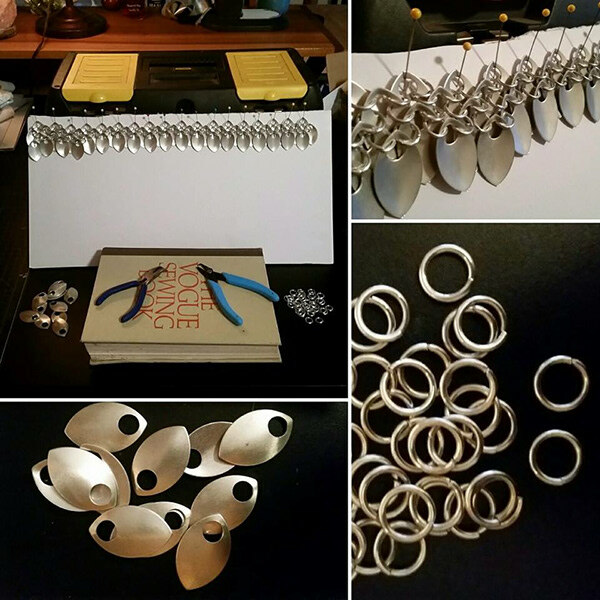 Each wing was dried and pinned into place before shaping the next. 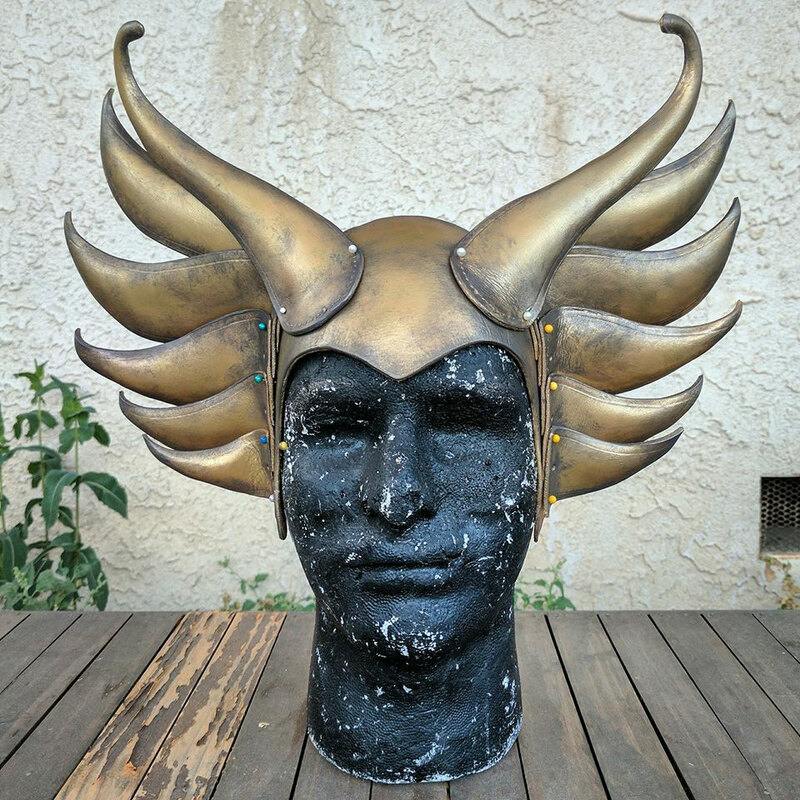 Once dry, I painted each piece a base gold and used various acrylic colors to add an aged patina. A semigloss clear coat was added to protect the finish before stitching everything together and adding the gem. 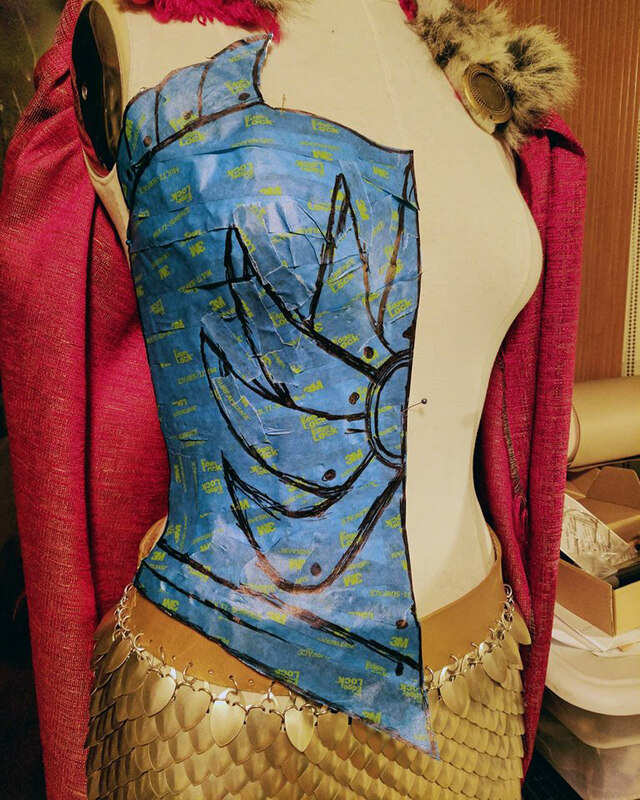 Next it was time to pattern out and create the breastplate. 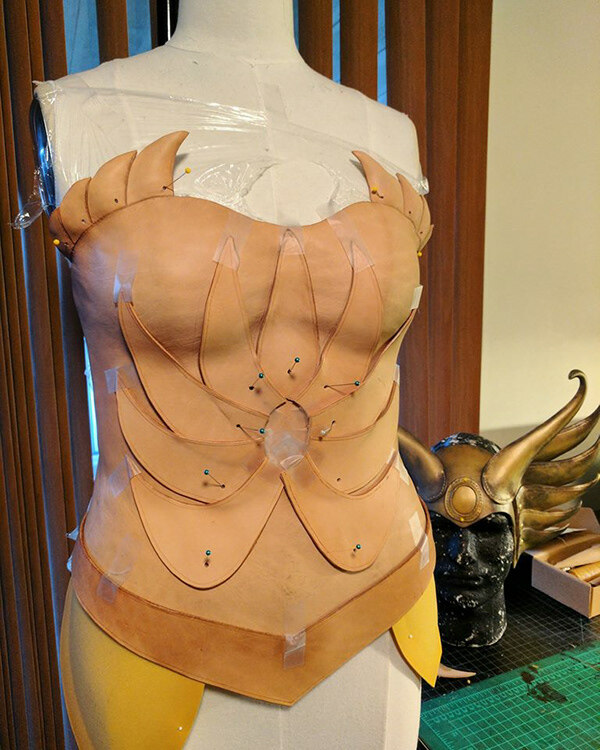 I created the pattern in tape on the mannequin, marking out pieces and placement, then cut the tape apart. 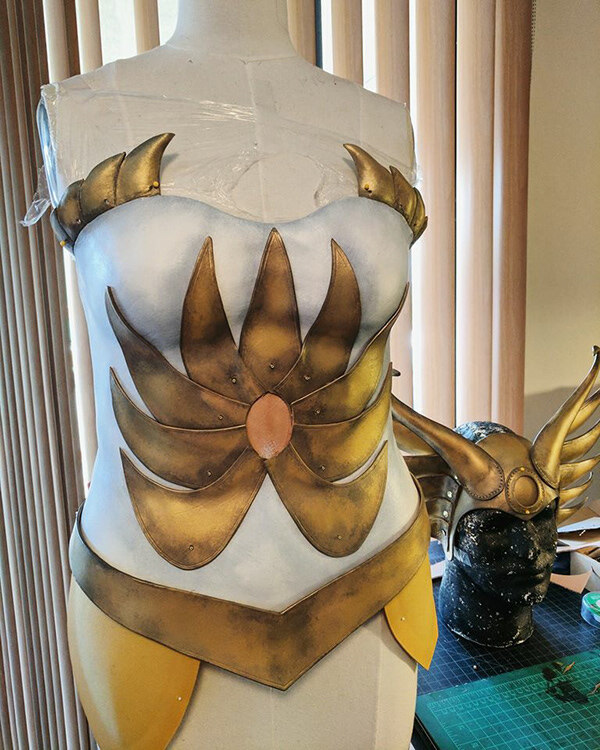 To match the artwork, I avoided any seams in the breastplate. To achieve this, it was cut from one large piece and wrestled into the correct shape over several hours! I wrapped my dress form in plastic and shaped it on the mannequin with the help of some shaping tools and a lot of brute strength. It was an excellent workout. Once shaping and tooling details were finished, it was time to paint. Base white and gold in leather acrylics first and then aging details, followed by a clear coat. 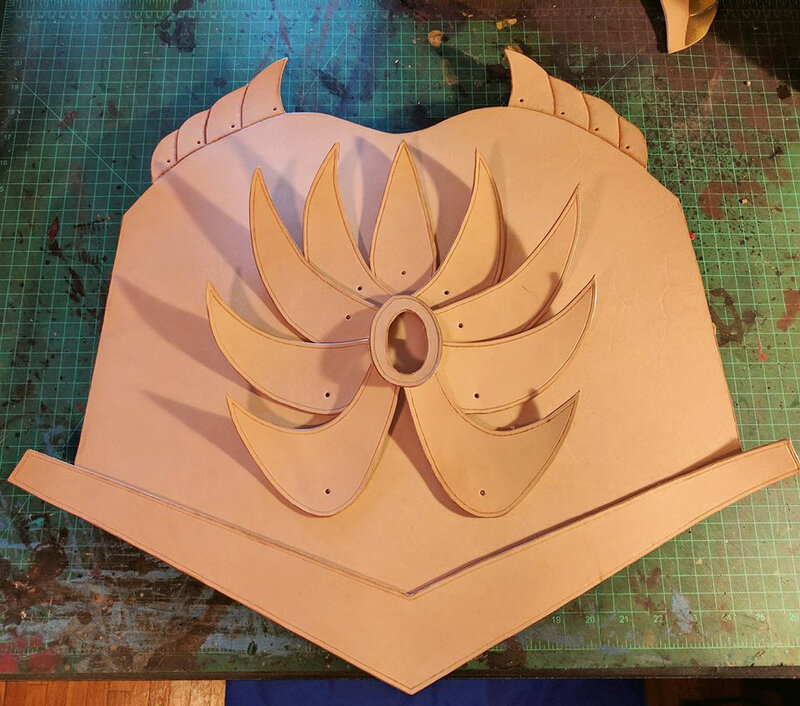 I lined the breastplate with felt for comfort and added straps across the back. Painted and ready for rivets. 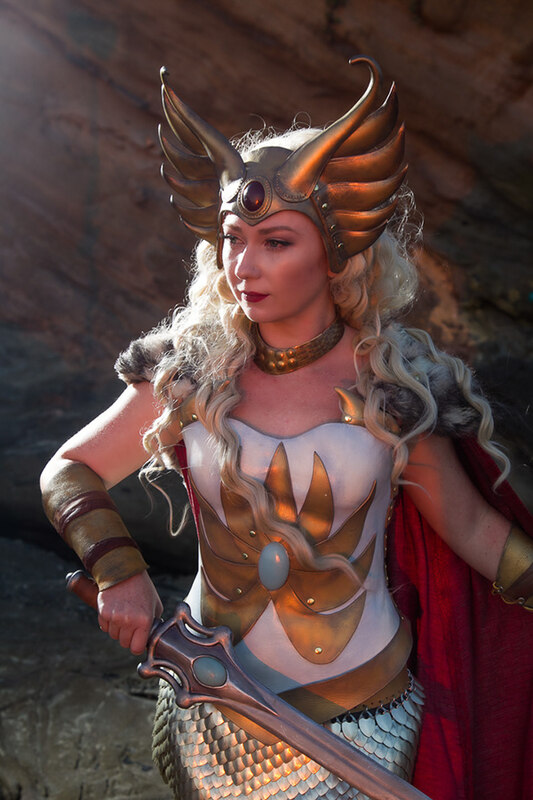 I sewed a cape in textured red fabric with a faux fur mantle, made matching greaves in gold crackle leather, and commissioned the talented Aubriana Zurilgen to create the iconic Sword of Protection to complete the look. 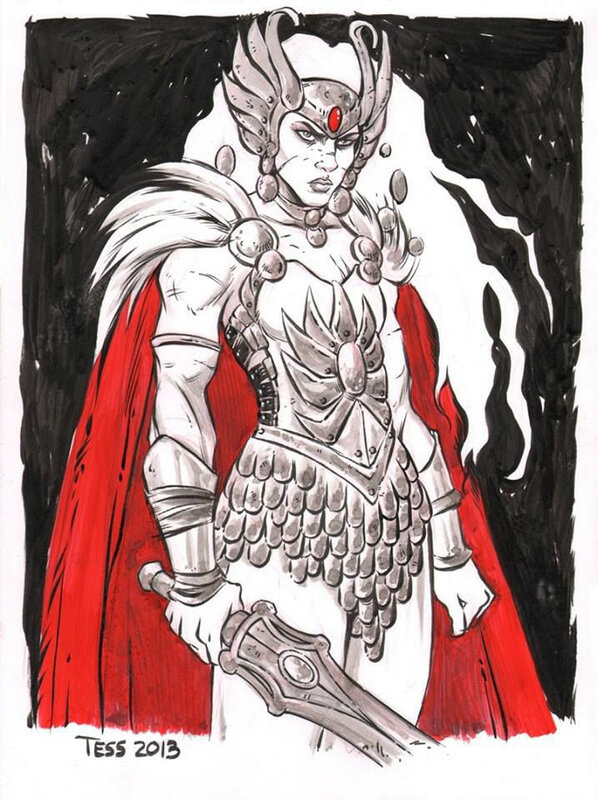 She also cast the gems for the helm and breastplate. With the sword complete, I created a quick leather belt and frog to carry it and added a leather wrap to the handle.